"I've been drawn to art since I was child, but couldn't pursue it at school, given the way school subjects were structured." That's how subscriber Keith Ruiter explained the beginning of his love affair with art and especially drawing female faces. I only met Keith recently via email. He had purchased my Mastering Proportion and Learning to Draw program. And only a week or so later he emailed me, wanting to buy another program that I had discontinued. That kind of enthusiasm always intrigues me, so I asked to see some of his work from both before and after the course. These first drawings, done some years ago, clearly show why he was drawn to art. They displayed, even then, a developing eye for proportions and a desire to improve art skills. Later he told me, "To me the most useful aspect of (Mastering Proportion and Learning to Draw) is having a consistent and reliable tool I can use to help me draw in proportion. It also helps answer the question: Where do I start? " "I spend the most time drawing portraits and figures, and it gives me confidence to know I will eventually end up with something that resembles what I am looking at (as long as I stick to applying your procedure, which is pretty logical to follow)." Have you ever tried to improve art skills by taking on one of the most challenging subjects there is? That is what Keith is doing when he's drawn to art of people and faces. "I know drawing and painting faces and figures are indeed challenging, but that's what I am drawn to most. I guess it started with all the gorgeous models in the glossy magazines from my childhood." I've long felt that if you can learn to draw the human figure well, you can learn to draw anything. His early drawings are nicely done. 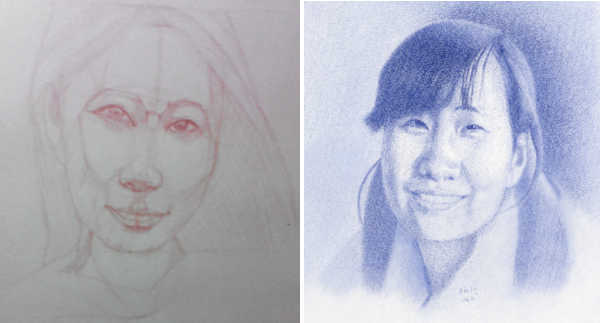 But, the colored pencil portrait he did (above right) after completing the Mastering Proportion course just blew me away. I kept admiring how this guy could improve art skills so much over the years when he hadn't taken an art class. He explained it by saying there were always glossy magazines at home, and he would try to copy the pictures of models in them. Or anything else he found appealing. During high school he borrowed books from the local library and kept trying to learn as much as he could. Then the internet appeared and increased the availability of art training online. And that's when he became more serious about acquiring artist tools and developing his drawing skills. Which he is obviously doing – one female face at a time. P.S. If you too are drawn to art like Keith, you may also share his dream. "I know I have yet to find my own artistic voice and lack the confidence to try to draw and paint for the purposes of selling art. But ideally, that's what I want to do. Do nothing but draw and paint and make a decent living from it." He ended his email explaining, "Needless to say, encouraging words from artists like you are very heartwarming and inspiring."